Remember the fresh enthusiasm you had for the beginning of the school year? All new school supplies, backpacks that didn’t look like they’ve been in a lion’s den, the nutritious lunches with a hand-written note, and clothes laid out the night before? Well, I'm EXACTLY the opposite at the end of the school year. When the end of the school year rolls around we are all crawling across the finish line. I’m all about teaching my kids to finish strong, but, I admit I checked out in the middle of May and I’m secretly hoping I’m not the only one. Did the homework packet get longer or is it just harder to get it done? Why is there still homework? Is anyone out there still checking homework, anyway? Hmm. And why does my daughter bring me her nightly reading books RIGHT.BEFORE.BEDTIME! Bedtime is sacred in our household. We have bedtime and we do bedtime. For sanity’s sake (mainly my own) we need bedtime! Not to mention, at this point she should know that bedtime is when I’m one notch away from becoming what my kids affectionately call me when I’m ready to snap, “Mommy Monster”. Yes, “MOMMY MONSTER IS ABOUT TO COME OUT IF YOU DON’T GET IN YOUR BEDS!” Between all the books, homework, labels, text messages, signs we pass, and journaling, I’m certain my daughter has logged 4949570379 hours of reading this year, so we’re covered if we miss a night. To top that, I was just reminded that my son needs a scarecrow costume (in two days people, TWO DAYS) for his end of the year play. Yes, I was told earlier in the month, but with all the emails (seriously, ALL OF THE EMAILS ABOUT ALL OF THE THINGS) it got buried somewhere in between end of the year goodie bag sign-ups, class gift ideas, and the endless list of year-end events conveniently crammed into the last week of school. A DIY costume was necessary, but, unfortunately for my son I’m so not your DIY mom. The very thought of a DIY costume stressed me out. So I did what any mom would do and I turned to Pinterest for the answer; only that didn’t make me feel better it made me feel worse because now the insanely high expectation and standard to make a DIY scarecrow costume is taunting me in the face. I shouldn’t have Pinterested; ignorance is bliss when it comes to these things. I grabbed a few supplies – a hula skirt, a straw hat (borrowed from a friend, thank you, Sheri) a hot glue gun, safety pins, hair ties, an old plaid shirt, and ripped jeans – and went to it. Five hours later I made an unimpressive scarecrow costume. Although I’m certain it’s sub-standard appearance won’t scar my son or put him on a therapist’s couch, I can’t help but feel it wasn’t my best work. But I can’t dwell on that too long, because nighttime reading! So, Mom out there sending Lunchables with your kid, who might be wearing wrinkled clothes, and turning in a half-completed homework packet, WE’RE ALMOST THERE! Hang in there, sister, you’re not alone. SHOW YOURSELF SOME GRACE, GOD SURE DOES! SHOW YOURSELF GRACE WHEN YOU'RE RUNNING LATE, WHEN YOUR KIDS' HAIR ISN'T PERFECT, OR THEIR END OF THE YEAR PROJECT ISN'T THE BEST. SHOW YOURSELF SOME GRACE! If we’re honest, sometimes we’re the only ones that put pressure on ourselves to be perfect for the sake of the approval of those around us. I get it; no one wants to be that mom. But then again, aren’t we all too busy living our lives and taking care of things to even wonder (let alone judge) who that mom is? 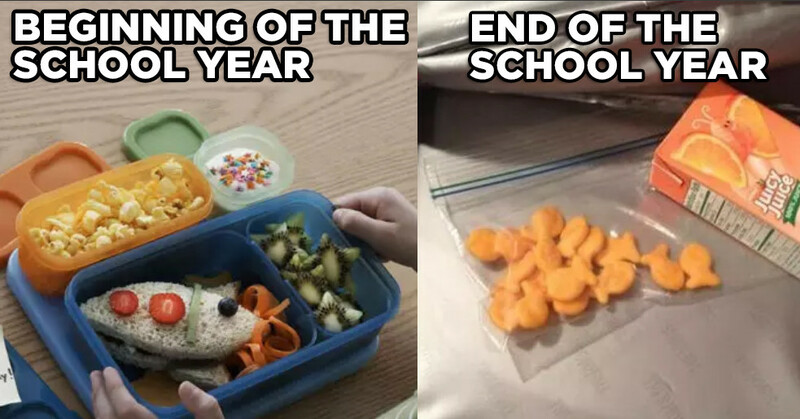 More times than not, other parents aren’t scanning our kid up and down to see what they’re wearing, the lunch proctors aren’t concerned with that being their third Lunchable in a row, and I guarantee you the teacher is just as excited for summer as we are to be disturbed by an unfinished homework packet.